Here are Fire Safety Store, we want every single person and company to have the tools and equipment in place to tackle fire before it has started. Preventative and early firefighting plans can start well before there is any need to panic. One way in which this can be achieved in certain places and industries is a smart approach to fire buckets. With this in mind, we are delighted to be able to offer a choice of metal and plastic pails. 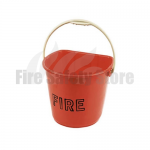 Fire buckets are most commonly associated with petrol forecourts or cooking areas where potential outbreak may be higher. They tend to be filled with sand and can help to fully or partially extinguish small oil fires. Water is useless in the fighting of such fires and may even help them thrive. By throwing sand on fires, they are starved of oxygen and cannot continue to prosper. 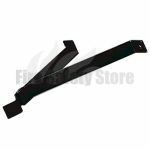 The plastic versions comes in a “D-shape” to enable a simple yet effective helping hand to wall mounting. The classic, metal styles still retain the traditional rounded bucket shape and both can be wall mounted using a bracket. Buckets should ideally be anchored and enclosed with a lid. All of our products come with a lid to reflect this. 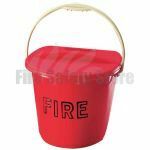 All of our high quality fire buckets feature a large 10 litre capacity and are easily identifiable being bright red in colour as well as adorned with the word “fire”. This provides a means of quick recognition of the products should they ever be needed. 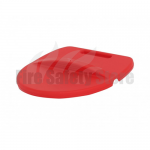 The brackets we supply to affix fire buckets that need to be clear of floor areas are all made of sturdy metal that is not in danger of collapsing under the weight of 10kg of sand. They can be used to mount both metal and plastic variations. Of course, a fire bucket is merely a can if it has no contents. We are able to provide you with the fire sand that fills a pail. Our dry, yellow fire sand has been sourced specifically for firefighting applications. It is ideal for absorbing many oily liquids and can greatly reduce the risk of combustion when applied to any spillages. It comes in a 12.5kg bag and will fill the entirety of our 10 litre buckets. It’s not just sand that can be used for consuming excess liquid. Here at Fire Safety Store, we also supply Flamezorb Spill Absorbent. This is similar but slightly different to sand. It has fantastic absorbing qualities and the contents will completely fill a bucket, but it is much more lightweight than sand at only 2kg a bag. It is also much easier to clear and dispose of than sand. Every product we stock and supply meets rigorous testing and fire regulations and our fire buckets, brackets, sands and absorbents are no different. If you require any assistance with any of our items, feel free to speak to a friendly member of our team. Give us a call on 0800 3160890 and a helpful representative will be happy to help.